Many anti-cancer drugs are “hydrophobic,” meaning they resist dissolving in the watery environment of the body. Micelles have a shell-like core that can carry and protect such drugs as they move through the body toward their targets. 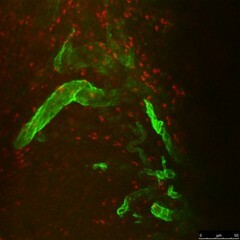 This image shows micelle-based nanoparticles (red) that have moved beyond the blood vessels (green) of a tumor in a mouse model of ovarian cancer. The nanoparticles diffused throughout the entire tumor within 48 hours of injection, suggesting excellent tumor-penetration capability.